• 57-6126 United States Army. Delivered 18-May 1958. Designated U-1A. Assigned to Europe possibly initially to the 2nd Aviation Company, based at Poitiers, France by Jan-1961. Jan-1962. Special Forces Detachment, Bad Tolz, Germany. May 1962 Coleman Barracks Depot, Mannheim. Oct-1963 Assigned to the 24th Engineer Group (Construction), Aviation Section, located at Kleber Kaserne, Kaiserslautern, Germany. 24th Engineer Group (Construction) pocket badge. Mar-1964 Shipped back to USA. May-1964 Army Aeronautical Depot Maintenance Center (ARADMAC) Depot, Corpus Christi, TX..
Jun-1964. Sharpe Army Depot, Stockton, CA. Nov-1964 339th Transportation Company, Nha Trang, Vietnam. Dec-1964 330th Transportation Company, at Vung Tau, Vietnam. Accident: Vung Tau, Vietnam. Jul-1966. The aircraft stalled on take off, crashed and burned out. Occupants escaped. Otter 265 was delivered to the United States Army on 18th May 1958 with serial 57-6126 (tail number 76126). Its initial unit allocation is unknown, but it was noted at Poitiers airfield, France, home of the 2nd Aviation Company, in January 1961.By January 1962 it was serving with the Special Forces Detachment at Bad Tolz, Germany. 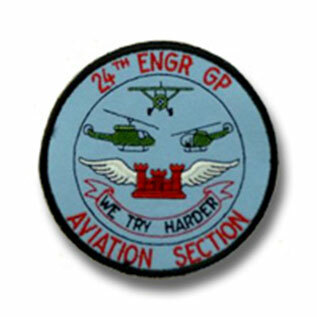 In May 1962 it went to the depot at Coleman Barracks, Mannheim and in October '63 was assigned to the 24th Engineer Group, Aviation Section, Germany. It left Germany in March 1964 and was transported back to the United States, arriving at the ARADMAC Depot, Corpus Christi, Texas by May '64. The following month it had crossed the country and was in the Sharpe Army Depot, Stockton, California where it was prepared for service in Vietnam. The Otter arrived in Vietnam in November 1964, with the 339th Transportation Company and the following month was assigned to the 330th Transportation Company at Vung Tau. It continued to serve with this unit until an accident in July 1966. 76126 stalled on take-off from Vung Tau, coming down in a churchyard. It crashed and burned. The occupants escaped, but the Otter was destroyed.